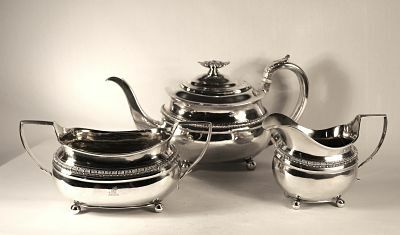 consisting of a teapot, milk jug and sugar bowl of plain form, each with gadroon design upper body and four ball feet. 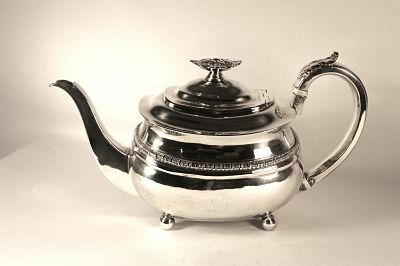 The teapot has ivory insulators, plain rounded handle,leaf thumb piece and oval flower finial to the hinged lid. The measurements are listed below, the length being from tip of spout to handle. 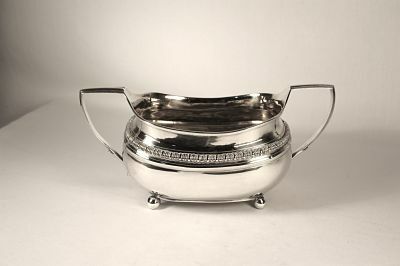 The oval sugar bowl has twin angled handles and gilded interior. It weighs 12.3 ounces or 349 grams and has a length of 216mm from handle to handle, breadth 115m and height 100mm. 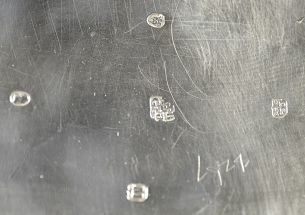 (8.4 x 4.5 x 3.9 inches). 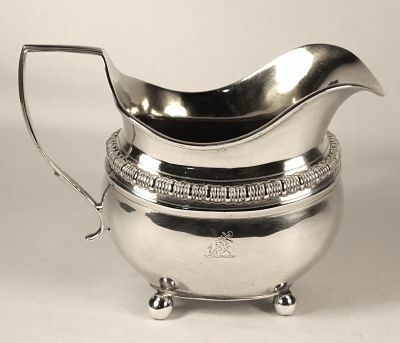 The milk jug has an angled handle and gilded interior. It weighs 7.2 ounces or 203 grams and measures 146 mm x 88 mm x 105mm high (5.8 x 3.4 x 4.1 inches). There is a small crest on each piece which is faded on the teapot.Total weight of tea set: 41 ounces or 1162 grams.